While I love this franchise, and the Mockingjay films in particular. I felt that, like most people, the decision to split the films hurt the flow of the story for general audiences. By changing the pacing for these films and having a year gap between them, character development suffered greatly, so the emotional beats weren't as effective as they should've been. For example, things that come into play in Mockingjay Part 2, were introduced at the beginning of Mockingjay Part 1, and so, I really think this edit will help with that. I highly recommend seeing The Hunger Games and Catching Fire right before my edit. This franchise is very consistent and the films tightly connected. The story will be much more enjoyable by seeing the "trilogy" back to back. - Part 1 is shortened to one hour. - Plutarch discussion with Alma Coin cuts directly to the hovercraft in District 12. No Boggs carrying Katniss to the hangar in District 13. - We cut from Katniss leaving the cafeteria, to his nightmare and little chat with Prim. No scene with her and Gale. - Katniss attempt of propo is shortened to one try. - The scene with Snow ordering an attack on the hospital in District 8 is cut (like the book, the attack is a surprise). The events on 8 are the same aside from that. - After Katniss and Finnick have a little chat, we cut to Katniss in the vents, and Haymitch telling her that they're rescuing the Victors. There's no atempt to do another propo outside. - The rescue scene and final speech by Coin are cut. 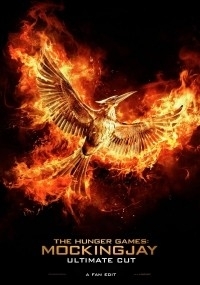 - We go to Katniss in her braceneck to the very first scene in part 2 when she tries to speak. - The events in District 2 are trimmed. There's no emphasis on loyalists that need to be persuaded, so Katniss speech and her being shot is cut. The relevant events in D2 are Gale's ideas for bombs (keypoint), Gale and Katniss diferences about morality in war, and the downfall of the Capitol's source of weaponry. So we go from the destruction of the mountain to the dinner in the Capitol's mansion. - There's no scene with Johanna in the hospital (remember Katniss isn't wounded in this version) and there's no scene with Katniss and Peeta in the hospital. - Once in the Capitol, Caesar broadcast is cut. We have Snow informing that Katniss is dead, and the group decides to go underground. - The walk underground is trimmed until the scene of the mutts. - Once in Tigris apartment, the chat between Gale and Peeta is cut. I wanted to make it a quick stop before going to the streets of the Capitol. - In this version, Gale goes on his own after Katniss ask him about THOSE bombs. There's no "Goodbye Gale"; he knows he fucked it up. - The last 15 minutes are the same, except for some really minor trims. A great edit that does a lot to keep the momentum that gets lost by dividing an already meandering story into two parts. I always felt Part 1 was the stronger of these 2 films, due to its stronger exploration of the media war theme, and more emotive storytelling, and these aspects get a little diluted here. One of Peeta's broadcasts in particular is missing, which I was sad to see. The rescue at the end of Part 1 also felt quite abrupt considering the slow pace of the film, their attempting something so dangerous, and it all happening off screen with such a quick cut felt wrong. But ultimately worth it to keep the run time down. I highly recommend this to anyone who was disappointed with the final films in the series. I've never been a big fan of the Hunger Games, I enjoy the second movie and a great part of the first, the books were nice but they did not make me a fan either, however it is obvious that due to the success of the whole franchise Decided to continue with the fashion of dividing the last delivery in two, which gave 2 films, which although they were not terrible films, lost the emotional connection that had been achieved in the second film. At the time of truth the fourth ni I even saw it in cinemas and waited for it to come out in homemade format. The edition tries to turn it into a 3-hour movie and it succeeds in its objective, I do not remember much of the originals, so I can not say that I miss something (except for Snow's background), I can say that if you're a fan of the books this edition, probably be to your liking, although it is not a purist edition is quite close to the feeling of books to keep the focus on District 13 and the Rebellion. Most of the problems of the edition were in part the original ones, Gale's disappearance in the last act, the unnecessary death of Finnick, the pace, etc. As for the edition, I do not remember any element that I miss, I've only seen the edition as a single movie, I have not yet had time to see it in a marathon, as the editor suggests, but as for an individual film, I recommend it in Particular, if you are a fan of other films.